Be the first to share your favorite memory, photo or story of Jeffrey "Jeff". This memorial page is dedicated for family, friends and future generations to celebrate the life of their loved one. 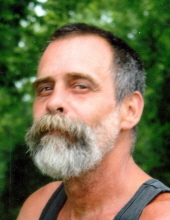 Leaf River – Jeffrey “Jeff” Allen Stoll, 55, of Leaf River, passed away, Thursday, November 8, 2018 at home. Born February 9, 1963 in Rockford, the son of Richard Dale Stoll and Judy Irene (Smith) Stoll. Jeff attended Winnebago schools and was a four year veteran of the United States National Guard. He was a commercial and residential flooring installer for over 30 years, and Damn Good At It!! Jeff loved being outdoors, mowing, working in his garden, his animals and worshiped his chickens. Jeff is survived by his soulmate, Sue Kutsch of Leaf River; Sue’s children, Mike (Carrie) Julson of Pecatonica, Mandi Cox of Ridott; daughter, Erica (Dan Anderson) Stoll of Pecatonica; son, Austin Feldt of Salisbury, NC; grandchildren Aryana Statum, Aaliyah Stoll, Carter Julson, Landon Julson all of Pecatonica; father, Richard (Clara) Stoll of Roscoe; mother, Judy Stoll of Byron; sisters, Joy (Duane) Melancen of Pecatonica, Christine Stoll Brown of Byron, Caryn (Jim) Bergagna of Winnebago; numerous nephews, nieces, uncles, aunts and cousins. Jeff is predeceased by his grandparents, Harold (Agnes) Stoll, Carl (Irene) Smith. Funeral service 11:00 a.m. Friday, November 16, 2018, at Genandt Funeral Home, 602 N. Elida St., Winnebago with Pastor Randy Snider of Cornerstone Family Church in Byron officiating. Interment at Pecatonica Cemetery. Visitation 4:00 p.m. to 7:00 p.m., Thursday, November 15, 2018, at the funeral home. In lieu of flowers memorials to the family. For an online obituary and tributes go to www.genandtfuneralhome.com. In lieu of flowers memorials to the family. "Email Address" would like to share the life celebration of Jeffrey "Jeff" Allen Stoll. Click on the "link" to go to share a favorite memory or leave a condolence message for the family.